Attraction Marketing is nothing new, it’s been around the advertising world for years and if you have watched any television ads or listened to advertisements on radio, and now YouTube, you have witnessed Attraction Marketing at work. It is only big corporations with advertising dollars to spend in those mediums (television and radio) building their brand. Now that same Attraction Marketing allows Network Marketers to compete with Madison Avenue. The advertisements that you see on the television, hear on the radio, and watch on YouTube from big corporation are designed to build brand recognition and educate consumers about their products with the hope that when you are looking to purchase such a product you will remember their ads and choose their product. When we think of Attraction Marketing in the Network Marketing Industry, attention and praise has to be given to Mike Dillard with his book Magnetic Sponsoring. Mike told us of his struggles as a Network Marketer and we could all agree with his pain, because we all have struggled and some continue to struggle at building their Network Marketing business. He also told us what he did to get over his pain and start to produce the type of income that he deserved. Magnetic sponsoring gave us a step-by-step blueprint for building a Network Marketing Business based upon the principles of Attraction Marketing. Network Marketers use Attraction Marketing in the same way that corporations do. They provide you with valuable information to educate you about the product or service that they are selling. Their mediums are slightly different, in that they write blog posts, publish articles, have both free and paid advertisement campaigns (not on the level that corporations do), submit videos to YouTube, have a fan page on Facebook, have Twitter accounts to Tweet their latest tidbit to entice you to click on their Tweet, and do so many more things to build their “BRAND” to compete with other Network Marketers. If you’re still using the old school Network Marketing strategy of making a list of 100 or your family members, friends, and co-workers and chasing them down to get them to buy the products or services that you’re selling, and not getting anywhere or having the success that you think you should have, get a copy of Magnetic Sponsoring and learn the principles of Attraction Marketing. If you’re still using the old school Network Marketing strategy of talking to anyone within three feet (The Three Foot Rule) of you about your opportunity, and you’re not getting anywhere or having the success that you think you should have, get a copy of Magnetic Sponsoring and learn the principles of Attraction Marketing. If you’re still using the old school Network Marketing strategy of dragging family, friends, and prospects to hotel or home meetings, and not getting anywhere or having the success that you think you should have, get a copy of Magnetic Sponsoring and learn the principles of Attraction Marketing. If you’re still using the old school Network Marketing strategy of buying leads and making cold calls, and you’re not getting anywhere or having the success that you think you should have, get a copy of Magnetic Sponsoring and learn the principles of Attraction Marketing. The principles of Attraction Marketing work and if you’re not using them to build you’re Network Marketing business, you will continue to get the results that you’re getting now until you learn (the learning curve for the Network Marketing Industry can be anywhere from six months to six years depending upon your ability to learn new strategies and incorporate them into your business building agenda) principles that will help you build your business the right way. So, if you’re tired of struggling and want to give yourself an advantage over your competitors that are not using Attraction Marketing to build their business, get yourself a copy of Magnetic Sponsoring and see how Attraction Marketing allows Network Marketers to compete with Madison Avenue when it comes to building “BRAND” recognition. Why Network Marketers Fail: And What You Can Do to Succeed! 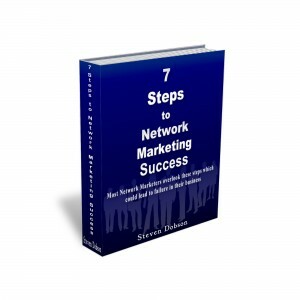 Previous post: Is Your Network Marketing Business Going To Survive 2012?